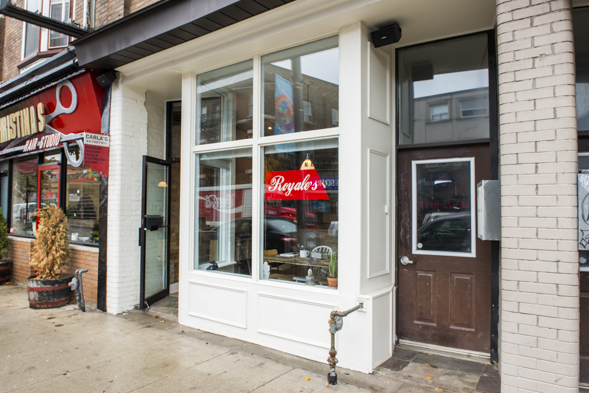 Royale's Luncheonette is a charming 15-seat eatery on Dundas West that deals in daytime fare. It's a small operation where warm proprietors Mark Dufort and Rose Patterson staff the place themselves along with a single hired gun in the open kitchen. 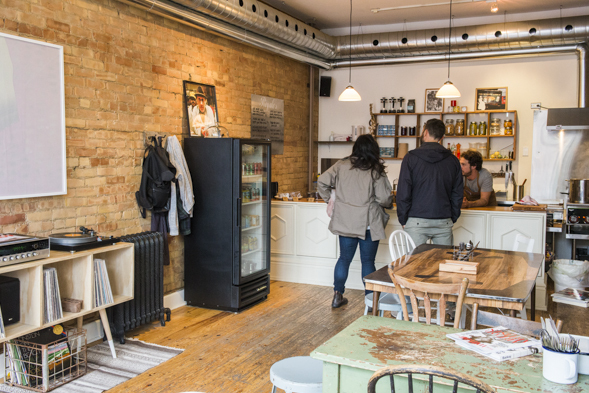 The space was formerly The Stem Flower Market and its worn wood floors and raw brick walls were what initially attracted Dufort. 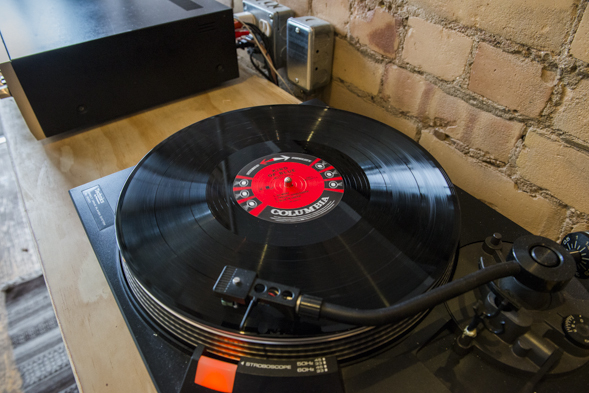 The kitchen is outfitted with sparkling new equipment, but the furnishings are mainly salvaged with the exception of the turntable cabinet stocked with Miles Davis and Willie Nelson albums. The hand-painted signage on the window reminds me of Beauty's in Montreal. It's the handy work of artist, Waylon Tait who is also responsible for some of the original pieces that adorn the walls. The counter is stocked with house-baked goods already cello-wrapped for easy grab and go. 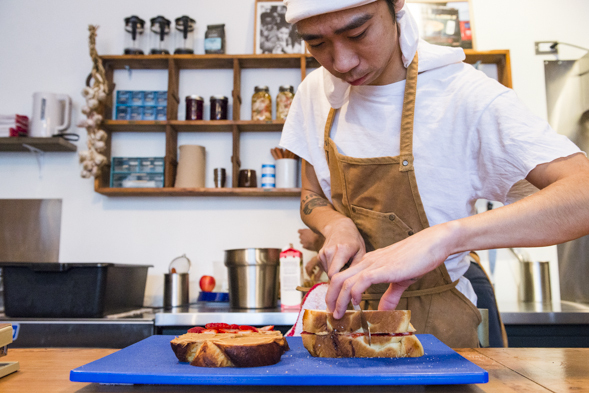 Most notable is the PB+J featuring freshly baked cinnamon challah with peanut butter and fresh strawberries. The menu is only 10 or so dishes long and it's scrawled with marker on a piece of stainless steel. It'll change weekly with few exceptions like the Royale with Cheese ($7), a burger that'll be among the fixtures. I'm expecting diner fare but the offerings are far more eclectic. The composed beet salad ($9) is another staple you can count on. It starts with a swoosh of goat cheese combined with yogurt for extra creaminess and features several veggies plucked straight from Dufort's garden. 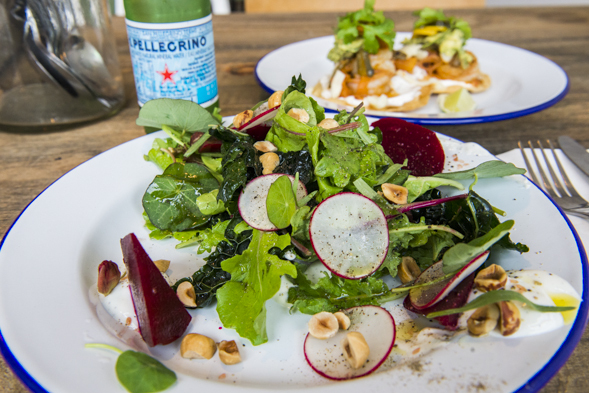 Here pickled beets and nasturtiums are bulked up with a medley of arugula, baby kale and black kale dressed in a sweet and tangy apple cider vinaigrette. Toasted hazelnuts and a splash of white truffle oil complete the dish adding nutty, earthy flavours and a nice contrast in textures. Also on today's menu, a shrimp tostada ($8.50), featuring crispy mini tortillas slathered with citrus crema and dusted in Tajin (that Mexican spice mix that tastes awesome on fruit). 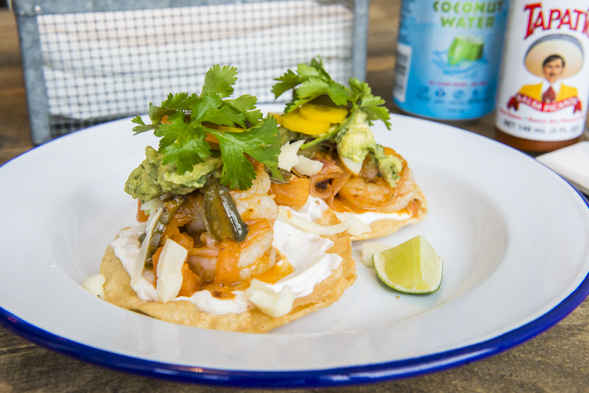 Seared shrimp in a tomato adobo sauce with nopal are piled on top and then there's a dollop of guacamole crowned with spicy, crunchy carrot pickles. The roast pork sandwich ($7.50) is a surprising favourite for me. I'm delighted to learn this is not in fact a pulled pork sandwich (something I've lost my taste for after overexposure), but rather a big messy Chicago-style hero. The pork is brined and roasted in house before being sliced ultra being reincorporated with au jus and piled onto a light, crusty Portuguese bun. 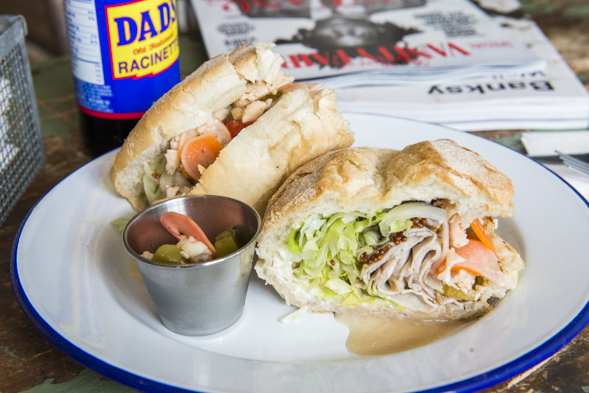 Shredded lettuce adds volume, and giardiniera (mixed Italian pickles) adds some crunch, and the whole thing is dressed with house-made aioli and triple crunch mustard. It's a saucy sandwich that falls apart when eaten, but dear god is it good. Royale's doesn't do coffee to go, but at the table there's a Pilot roast available in a French press. In the future you might find a set menu implemented on weekend evenings, but even if this place gets licensed, the intent is to offer BYOB sans corkage fee.